I am alternating between intense bouts of planning and exhaustion. When I have energy, I focus on what I can do and how I can prepare for the time I will be out of action. When I do not, I sleep. Yesterday we worked on converting our dining room into a play room for Alannah. There’s a bit to go, but it is taking shape and she loves it. We had lunch out with friends. Darren is organising a few “last suppers” for us before the liquid diet is imposed. It can be a fine balance between the right level of pain relief and functioning. I seem to have no appetite, but I eat well at each meal time. As I said, the things I can control. On the day they first identified my tumour, I had my first CT scan. Tomorrow I will have my second, along with an MRI. Dr Post-haste, my new oral and maxillofacial surgeon and leader of the team that will slice and dice Blaster and me, wants more detailed information to prepare for surgery. While the first CT scan was diagnostic only, it does give a pretty good idea of the damage Blaster had done when we first met on 9 May, just over a month ago now. 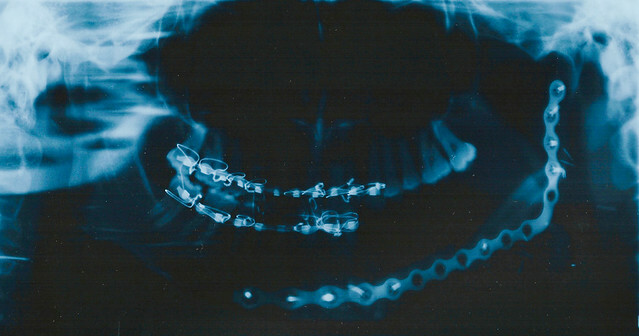 The first image is a horizontal cross-section of my head, as if you’d beheaded me a little high at my lower jaw level. Up the top, you can see my teeth and, down the bottom, my spine. On the left, my perfectly healthy right lower jaw bone. 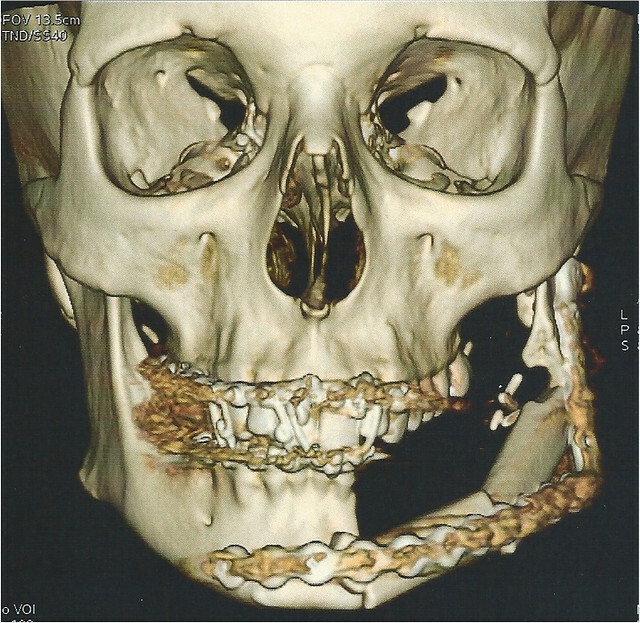 On the right, you can see how the tumour has eaten away and stretched my left lower jaw bone. This is where my jaw is paper thin. 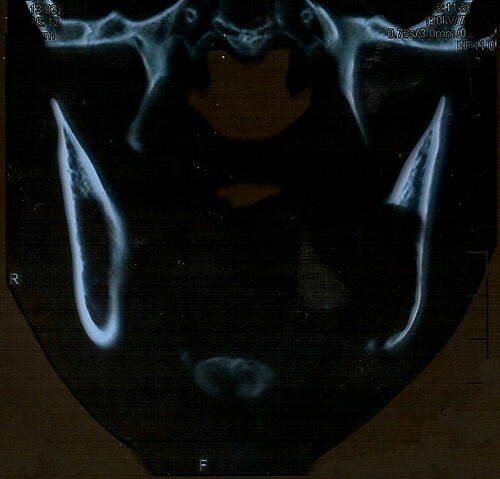 This next scan is a vertical cross-section of my head. Up the top are my sinuses. They are hard to make out I know as they are just black voids. Down the bottom are my jaw bones. 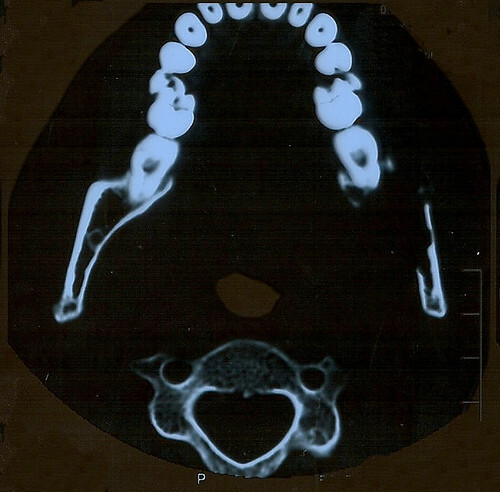 Again on the left is my perfectly healthy right lower jaw bone. 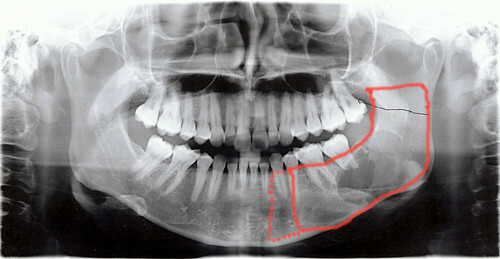 On the right, you can see that there is little of my left lower jaw bone left. The black is the tumour.